Maria (or Marie or Manja) Federau, daughter of Jacob and Maria Federau, was born in 1894 in Marjanovka, Ukraine. She received secondary education at Neu-Halbstadt. She was converted at the age of thirteen and after that she taught Sunday School in her church. For four years, she also taught a class of poor children without receiving any monetary compensation. In 1924, she immigrated to Canada, settling in Kitchener, Ontario, where she worked in a sewing factory for 38 years. She was a faithful church member, teaching Sunday School, singing in the choir, corresponding with numerous missionaries, and sewing many blankets. Gradually, she lost her eyesight, and finally she moved first to the Pinehaven Nursing Home in Kitchener and, in 1987, to Tabor Manor, St. Catharines. She died on 26 September 1995. The Maria Federau fonds consists of documents relating to her immigration to Canada and an autobiography. Description by Conrad Stoesz; updated by Jon Isaak July 2017. The accession numbers are 2003-044, 2017-021. Related material: N.J. Fehderau's memoir, From the Heights into the Depths (trans. Margaret Harder, 1997), and a condensed and edited version (by Anne Konrad), A Mennonite Estate Family in Southern Ukraine (Pandora Press, 2013). Related material: Nicholas Fehderau fonds. Maria Fehderau. Immigration medical certificate and landing card. -- 1924. Two receipts for money by Maria Fehderau toward Travel Debt. -- 1924–1925. Citizenship and naturalization papers for Maria Fehderau. -- 1929. Old Age Security application for Maria Fehderau. -- 1970. Biographical sketch and funeral service bulletin for Maria Fehderau. -- 1995. Autobiography of Maria Fehderau. -- 1982. 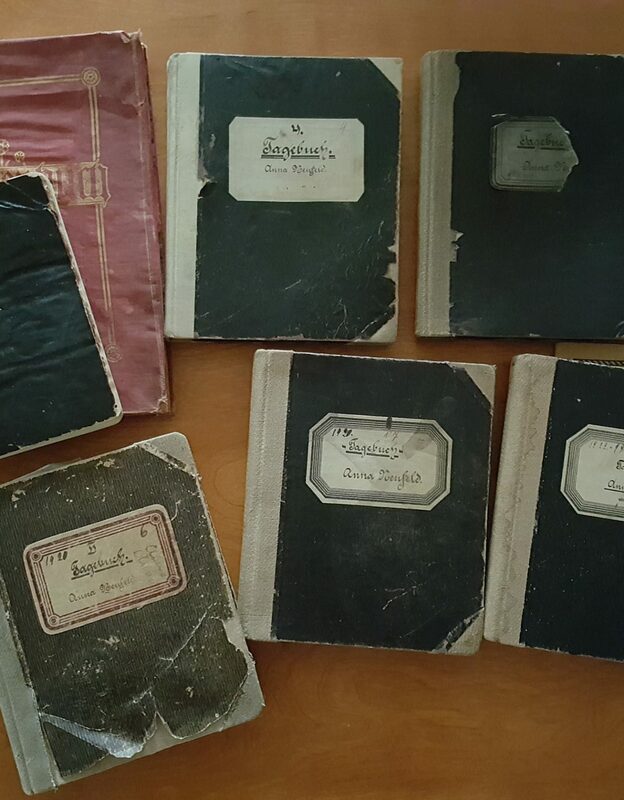 Two autograph books belonging to Marie (Manja) Fehderau. -- 1924–1929.